Pre-Romantic Poetry intervenes powerfully in debates about eighteenth-century writing, Romanticism, and literary history. By arguing that ‘pre-romanticism’ exists to patrol the limits of ‘romantic’ writing the book questions existing approaches to eighteenth- and nineteenth-century writing, and to period-based study more generally. As well as presenting pioneering re-interpretations of poets such as Thomas Gray and William Cowper, Pre-Romantic Poetry reads late-eighteenth-century poetry alongside earlier writers (especially Alexander Pope) and later ones (including William Wordsworth and John Keats). Paying particular attention to pastoral poetry, patronage, and occasional poetry, the book historicizes questions of language and form in order to shift prevailing notions of eighteenth-century and Romantic writing. 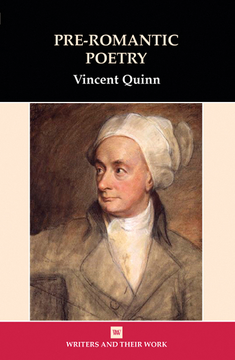 Vincent Quinn is a Senior Lecturer in English at the University of Sussex. He has published on eighteenth-century writing, Irish literature and culture, and the history of sexuality. His poetry and fiction have been published in literary journals in Ireland and the US, and he is the author of a novel, Worth Fighting With.